When you press the Command, Control and space bar keys, you should then see an emoji keyboard that looks similar to the one pictured below. Ple ase note, that older Apple keyboards display a icon that some say looks like a four-leaf flower on the Command key. This icon is depicted to the left. Newer keyboards have the word Command printed on the key. The Control key is labeled Ctrl. If you use a non-Apple keyboard you might have to experiment a bit with the keys in the lower left-corner of your keyboard to find the proper combination. I know that this keyboard shortcut works on OS X Mavericks (aka OS X 10.9) and newer. It does not work on OS X Snow Leopard (aka OS X 10.6). 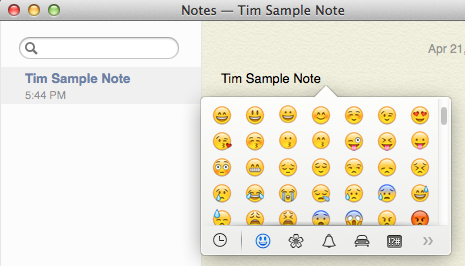 Read more about easily, emoji, insert, keyboard shortcut, mac, type.